The family of Mrs. Virginia Ann Kendrick, a US Army Veteran, requests the presence and participation of the San Antonio Patriot Guard Riders at the graveside rendering of military honors of their loved one. Virginia Ann Kendrick was born on October 9, 1938 in Fredricksburg, Virginia Ann passed away on March 28, 2019 in San Antonio, Texas. 1. Iron horses if you can, cages are always welcome and appreciated and unless under special circumstances not allowed in processions. You do not have to have a motorcycle to participate in honoring our veterans. 2. Safety First: Please remember to properly hydrate (including the night before) before any outdoor activity and to dress appropriately. Do not hesitate to take a break at any time if you feel you need to get in the shade or get indoors and always ask for help at any time. Also please do not forget your sun screen. 3. Please remember that our mission is to stand tall and silent, and with honor and. NO TALKING, SMOKING, CHEWING OF TOBACCO PRODUCTS, OR CELL PHONE USE IN THE FLAG LINE! 4. Cemeteries are hallowed ground. Please keep radios off and engine noise to a minimum. Observe the 15 MPH speed limit. Show our respect to ALL who are in attendance. 5. If riding/driving a motorcycle on Fort Sam Houston National Cemetery, which is located within a Military Installation, you will need to wear closed toe shoes, long sleeve shirt, gloves, DOT approved helmet, eye protection, long pants, and boots/shoes that cover the ankle. Before volunteering and/or attending any San Antonio Patriot Guard Riders missions we encourage you to review all safety information below. Included are some potential safety concerns to be aware of, however this does not include the full scope of all potential hazards. Anyone attending any San Antonio Patriot Guard Riders mission understands that they do so at their own risk. 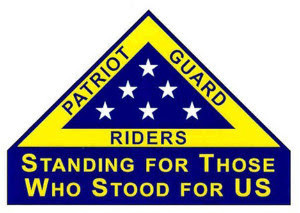 Neither the Patriot Guard Riders Organization nor its representatives are liable for any damages incurred on any PGR mission or event. Copyright © 2019 San Antonio Patriot Guard Riders.